APR170339 - BLACK DAWN' part five! The Man of Steel faces the one foe he refuses to fight-his son. An emerging new abili..
APR170340 - BLACK DAWN' part five! The Man of Steel faces the one foe he refuses to fight-his son. An emerging new abili..
APR170341 - BLACK DAWN' part six! 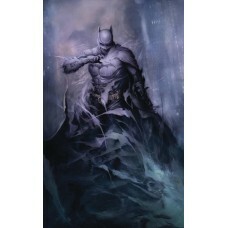 The extra-sized finale to 'Black Dawn' reveals the villain tearing the Super-Family ap..
APR170342 - BLACK DAWN' part six! The extra-sized finale to 'Black Dawn' reveals the villain tearing the Super-Family ap..
APR170343 - Battle in the Batcave'! 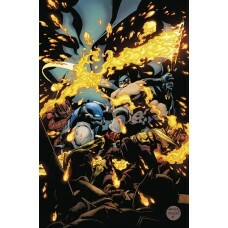 The battle with Kid Amazo leaves Jon and Damian's friendship in ruins as the boys de..
APR170344 - Battle in the Batcave'! 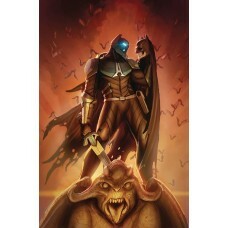 The battle with Kid Amazo leaves Jon and Damian's friendship in ruins as the boys de..
APR190464 - The finale of the Arkham Knight saga arrives as the Knight's surprising cult within Arkham Asylum unleashes ..
APR190465 - The finale of the Arkham Knight saga arrives as the Knight's surprising cult within Arkham Asylum unleashes ..
APR190466 - Detective Jim Corrigan has been shot on the streets of Gotham City-and the Spectre must reach out to Batman ..
APR190467 - Detective Jim Corrigan has been shot on the streets of Gotham City-and the Spectre must reach out to Batman ..
APR190530 - Teaming Batman with his son Damian, a.k.a. 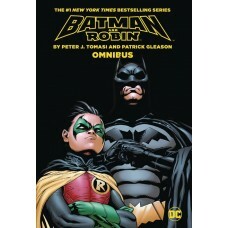 Robin, writer Peter J. Tomasi and artist Patrick Gleason's run on..
DEC160240 - When I grow up' part one! The sons of Batman and Superman have graduated to their own monthly comic-but if t..
DEC160241 - When I grow up' part one! 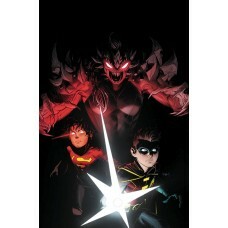 The sons of Batman and Superman have graduated to their own monthly comic-but if t..
DEC160315 - MULTIPLICITY' finale! 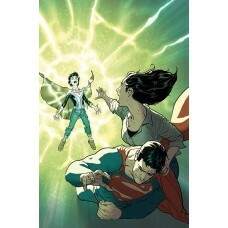 Superman, New Super-Man and Justice Incarnate make their last stand against their mult..
DEC160316 - MULTIPLICITY' finale! 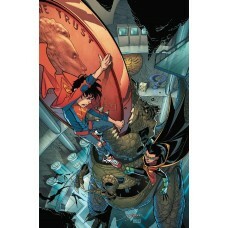 Superman, New Super-Man and Justice Incarnate make their last stand against their mult..
DEC160317 - DARK HARVEST'! Jon and Cathy go deep into the woods of Hamilton to find a horror that hungers for the new Su..
DEC160318 - DARK HARVEST'! Jon and Cathy go deep into the woods of Hamilton to find a horror that hungers for the new Su..
DEC160339 - After the thrilling events of issue #1, writer Peter J. Tomasi and artist Neal Adams rescue the Last Boy on ..
DEC160340 - After the thrilling events of issue #1, writer Peter J. Tomasi and artist Neal Adams rescue the Last Boy on ..
DEC160390 - In 'Savage Dawn,' Superman is forced to join a super-fight club-and the stakes couldn't be higher. The Man o..
FEB170164 - Superman black' part one! A 'Superman Reborn Aftermath' tie-in! As the smoke clears the Kents are faced with..
FEB170165 - Superman black' part one! A 'Superman Reborn Aftermath' tie-in! As the smoke clears the Kents are faced with..
FEB170166 - Superman black' part two! A 'Superman Reborn Aftermath' tie-in! The Man of Steel is challenged to break his ..
FEB170167 - Superman black' part two! A 'Superman Reborn Aftermath' tie-in! The Man of Steel is challenged to break his ..
FEB170243 - When I Grow Up' part three! It's Super-Son vs Bat-Son as the exciting new series continues! 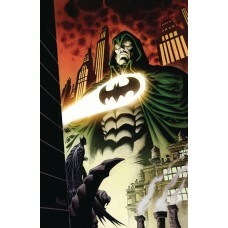 Kid Amazo is rea..
FEB170244 - When I Grow Up' part three! It's Super-Son vs Bat-Son as the exciting new series continues! Kid Amazo is rea..
FEB170317 - With his final days upon him, the Man of Steel reaches out to his loved ones and allies to say his good-byes..